City of Wilson is proud to call itself North Carolina's First Gigabit City. It offers ultrahigh-speed Internet, voice, and video at affordable rates to its residents. Greenlight Community Broadband (Greenlight), North Carolina's community-owned Fiber to the Home (FTTH) network, makes this possible. According to Will Aycock, general manager at Greenlight, "Our whole operation is about two things—customer service and efficiency." Aycock noticed that the number of service trucks dispatched was at an all-time high. Greenlight needed a way to monitor all daily work orders. The web application and business intelligence solution transformed Greenlight's telecom data warehouse into a full-blown command center and monitoring system. At the core is Esri GIS technology, which Greenlight relies on to tap into any existing data, streamline processes, build custom reports, display critical data via a dashboard for the leadership teams, manage its work force, and increase efficiency across all departments. The Virgin Islands Next Generation Network (viNGN), headquartered in St. Thomas, was established in 2010 to provide all Virgin Islands residents with fast, reliable Internet service. This network's goal is to connect the Virgin Islands to the rest of the world. 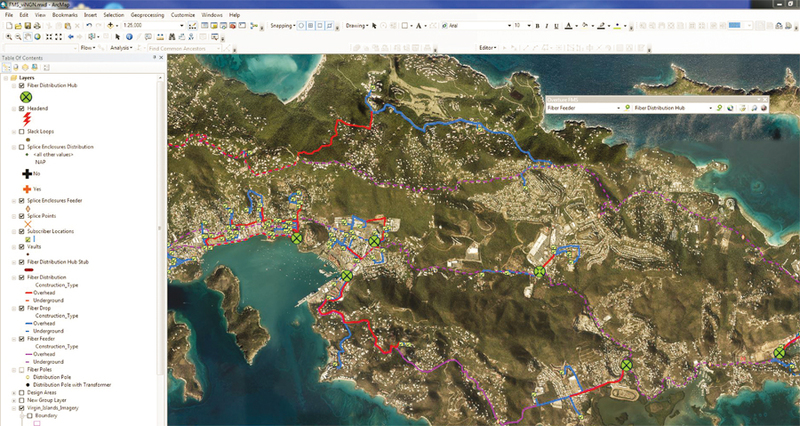 The Esri-based technology fulfilled viNGN's operational objective of integrating base fiber design drawings previously created in ArcMap into the system and enabling fiber assignment review. Overture FMS, integrated with viNGN's OSS/BSS database from ETI Software, supported viNGN's optical-based Carrier Ethernet network. viNGN can now import new customer records and export fiber assignment queries to the OSS/BSS solution, eliminating dual entry and costly data conversions. At the heart of this technology lies Esri's ArcGIS for Desktop. 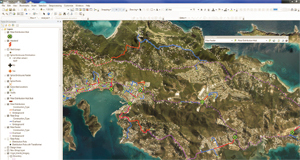 The tool utilizes existing ArcGIS technology and incorporates an easy-to-use interface so engineers and managers can create new design areas and edit existing infrastructure. Because viNGN uses an industry-standard geodatabase model, engineers and managers can manage, track, and view outside plant data. Since viNGN already had Esri licenses for ArcGIS for Server and ArcGIS for Desktop, the team's next task was to travel on-site and train the viNGN personnel. Three days of training and system configuration ensured success moving forward. As viNGN expands to provide more services to the islands, it will continue to improve efficiency, make better management decisions, and optimize performance and revenue.